"Piran" PLL DNA:Clear and is fully health tested for BAER,UPC,HEART,PKD,KIDNEY & PATELLA. 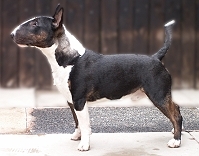 Owned by Mary & Nigel Barrett Margins Miniature Bull Terriers. Rocki is fully health tested Clear for BAER,UPC,Heart & PLL. He holds a current Interbreeding pass from the KC. Rocki has been lightly shown this year and has gained 1CC with BOB & 1RCC.